Precision machined from tough, stressproof steel with square-profile fingers that grip the sight notches firmly and won't "roll out"; provides easy, exact sight adjustment. Plus, they resist bending and breaking to give years of service. Deeply drilled body fits both issue and tall blade sights. An extra-nice touch are the hex-shaped bodies; they're easy to grasp, easy to turn and won't roll off your bench. Three tools: A1 five-prong and A2 four-prong fit front and rear sights. A1/A2 is double ended to fit both five-detent A1 and four-detent, square blade, A2 front sights only. A2 wrenches also fit FN SCAR. Presisjon maskinert tøff, stressproof stål med square-profil fingre at grep synet hakk fast og ikke "rulle"; gir enkel, nøyaktig syn justering. Plus motstå de bøying og bryte for å gi års tjeneste. Dypt boret kroppen passer både problemet og høye blad severdigheter. En ekstra fin touch er hex-formet organer; de er enkle å forstå, lett å slå og vil ikke rulle din benken. Tre verktøy: fem-spiss A1 og A2 firepinnet passer foran og bak severdigheter. A1/A2 er doble endte som passer både fem-detent A1 og fire-detent, firkantet blad, A2 foran severdigheter bare. A2 skiftenøkler passer også FN SCAR. I had never used an M16/AR15 front sight adjustment tool. I always had used the tip of a bullet. 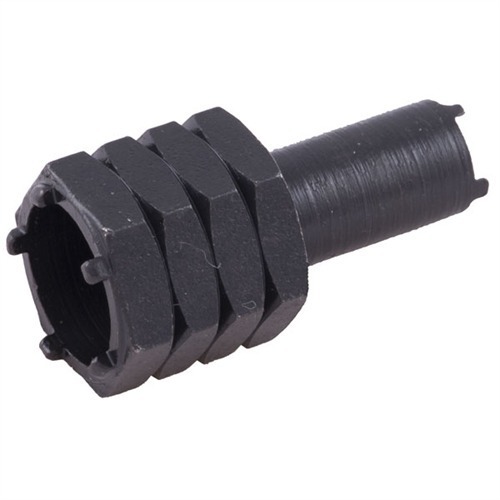 But when the detent holes were too small to fit the bullet tip on a particular rifle, I first tried the other sight adjustment tool (in the same listing as this tool), but that wouldn't fit because of diameter. This tool is flawless and allows adjusting front sights with either 4 or 5 detent holes. It seems like you can't predict when the sight you need to adjust is a four or five prong-- this solves that dilemma. This tool didn't fit the front sights on any of my A1/A2 rifles(7 of them). The inside diameter of the tool is to small. I had to carefully bend the teeth out and open up the I.D. with a round stone. I then had to file the corners of the teeth to allow me to turn the sight. This unit DOES NOT fit a Yankee Hill folding front sight or a Rock River standard A2 - Brownells should list which sights it DOES fit, if any.Besides the fit issue, the basic quality of the "tool" is extremely poor and definately not worth $16.99 - should be more like $2.99. Save your money and look elsewhere - don't bother with this piece of junk! The correct tool for my Colt 6940. This tool has all the improvments to make it outstanding. It is perfect for me because my AR-15s have A2 front sight posts and A1 rear adjustment wheels. The problem is that the tines or teeth on both ends are not long enough to press down on the spring detents and allow you to turn the front or rear sights. You have to use this tool to turn the post or wheel while using something else to depress the spring detents. The old tool didn't have the cool new look and the ability to put a wrench to it but at least it worked on its own. A simple lengthening of the teeth/tines on this tool would make it an outstanding adition to any AR-15/M-16 shooters tool bag. As the previous reviewer stated, this piece of garbage doesn't work. The prongs are not long enough. If you've got the right size file, you might be able to get it working, but if you pay [$]for a super simple tool, it ought to work...and if you don't do it just right, you'll simply ruin the tool.How does anyone adjust this sight? Seems like it ought to be easy...hardly. Still searching for a tool that will work without destroying my fifty-dollar tritium front sight. I gave a scathing review of this tool below, but have learned a little more about it since and would like to revise my statement. I can't edit that review, so I'm adding another one. My front sight is a Samson and the fit of the post seems a bit tight. Moreover, I was adding a Trijicon tritium post and it's built a little differently than the standard one. The part of the post that this tool turns is taller on the Trijocon than the standard one and the prongs on the tool aren't long enough to depress the pin far enough to let the post turn, so this tool will not work on that sight. It will probably work okay on a standard post, as long as it's not too tight. I've never used a front sight tool before. Normally I would just use the tip of a bullet. However, my Bushmaster front sight detents for the front sight were too small to fit the bullet tip. Nothing else worked - not even a small jeweler's screwdriver. I tried both Brownell's AR15 sight wrenches, and this was the right one for me. I'll probably buy a few more to have them on hand. Bought this to use on the Tech Sights. This tool will not fit in the rear sight holes. The diameter of the pin pattern on the tools is too small. I compared it to another that I have which works on both the Tech Sight and A1s. I have not tried this on an A1 though as I dont own one so it might work on that. Very disappointed. Only reason I didnt send it back is because I need the 5 prong front sight tool. Perfect fit and easy adjustment on my old Colt SP1 pre-assist. Hex design made for a good grip. Only used this one time so can't determine durability of tool. I will say that there is very little strain - should last hopefully. The pins were just long enough to engage but not make contact with carry handle. A2 AR-15 Sight Wrench Presisjon maskinert tøff, stressproof stål med square-profil fingre at grep synet hakk fast og ikke "rulle"; gir enkel, nøyaktig syn justering. Plus motstå de bøying og bryte for å gi års tjeneste. Dypt boret kroppen passer både problemet og høye blad severdigheter. En ekstra fin touch er hex-formet organer; de er enkle å forstå, lett å slå og vil ikke rulle din benken. Tre verktøy: fem-spiss A1 og A2 firepinnet passer foran og bak severdigheter. A1/A2 er doble endte som passer både fem-detent A1 og fire-detent, firkantet blad, A2 foran severdigheter bare. A2 skiftenøkler passer også FN SCAR. A1 AR-15 Sight Wrench Presisjon maskinert tøff, stressproof stål med square-profil fingre at grep synet hakk fast og ikke "rulle"; gir enkel, nøyaktig syn justering. Plus motstå de bøying og bryte for å gi års tjeneste. Dypt boret kroppen passer både problemet og høye blad severdigheter. En ekstra fin touch er hex-formet organer; de er enkle å forstå, lett å slå og vil ikke rulle din benken. Tre verktøy: fem-spiss A1 og A2 firepinnet passer foran og bak severdigheter. A1/A2 er doble endte som passer både fem-detent A1 og fire-detent, firkantet blad, A2 foran severdigheter bare. A2 skiftenøkler passer også FN SCAR. A1/A2 AR-15 Sight Wrench Presisjon maskinert tøff, stressproof stål med square-profil fingre at grep synet hakk fast og ikke "rulle"; gir enkel, nøyaktig syn justering. Plus motstå de bøying og bryte for å gi års tjeneste. Dypt boret kroppen passer både problemet og høye blad severdigheter. En ekstra fin touch er hex-formet organer; de er enkle å forstå, lett å slå og vil ikke rulle din benken. Tre verktøy: fem-spiss A1 og A2 firepinnet passer foran og bak severdigheter. A1/A2 er doble endte som passer både fem-detent A1 og fire-detent, firkantet blad, A2 foran severdigheter bare. A2 skiftenøkler passer også FN SCAR.